The Emerald Isle Collection from Belleek is a lovely collection that brings a fresh, colorful look to any décor. Lovely flowers such as wild roses and primroses adorn classic, scalloped shapes. Hand-painted shamrocks accent the pieces. This Belleek bowl is crafted of fine china and it is part of the Emerald Isle collection. 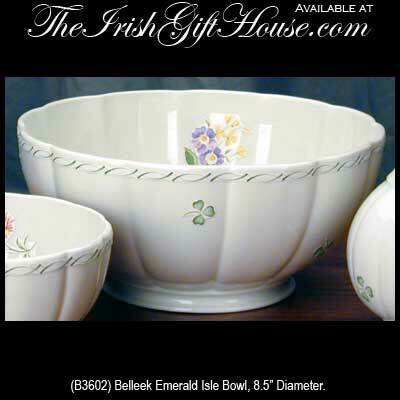 The Emerald Isle bowl measures 8 1/2" in diameter and it is handmade in Belleek, Ireland. The Belleek China bowl is gift boxed with a shamrock history card, complements of The Irish Gift House.